Snack and Study! April 21st and 22nd 2014, 9:00am-5:00pm, Village Drive. Exams are coming up! Need a quiet place to study! Study space available in the new building (where we had the picnic) this week. * April 21st and 22nd 9:00am-5:00pm board room fist floor. See directions signs in building. 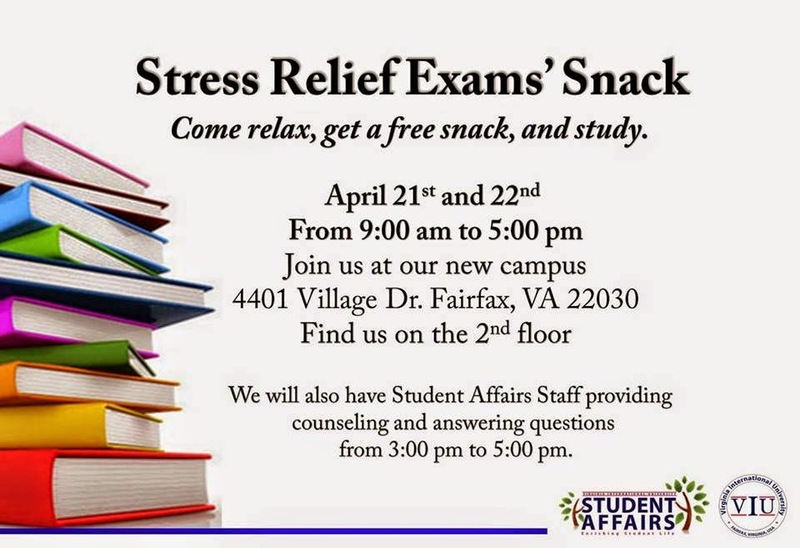 Both days we will have snacks available to help you study, student affairs counseling Student affairs from 3:00-5:00pm and shuttle service to and from Pender. Pick-up/drop off every hour between Student Center and Village Drive. Internet available. * Study room is also available all week, 9:00am-5:00pm, in the upstairs cafeteria at the back of the building. Space for individual students and groups. Registration: Registration not require but we would love to know if you are coming!